a variegated hosta. Photo credit; Danielle Sherry. 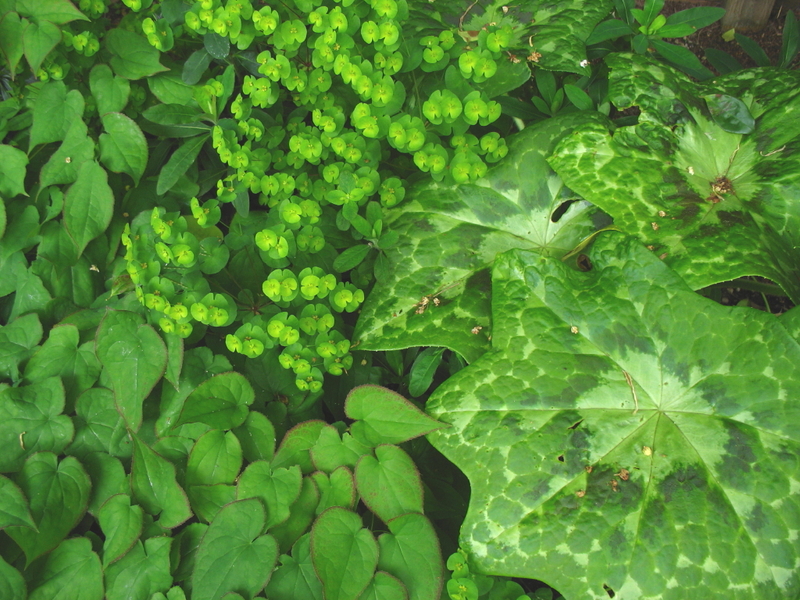 Love them or hate them – you can’t ignore variegated plants. They vary from brazen stripes to subtle freckles, Pollock style splatters to spidery veins. Depending upon their particular form and color, patterned foliage can blend, enhance or brighten the garden, helping to tie other plants together or create a new focal point. blue star creeper repeats the blue tones of the hostas. ﻿Perhaps the most well known form of variegation is that where a leaf margin is in a contrasting color. Hostas are available in every possible combination of green, chartreuse, blue, yellow and white, with the margins on these bold leaves often being over an inch wide. Such striking foliage begs to be highlighted and wonderful combinations can be made by association with a finely textured companion which echoes this secondary color. 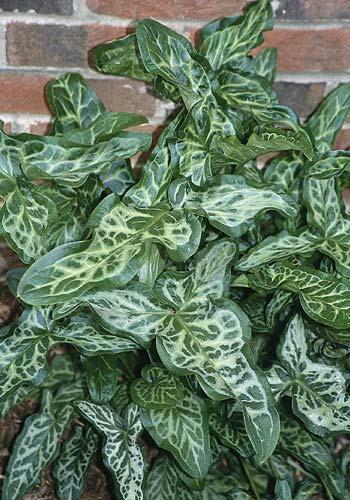 For example underplanting a blue and green variegated hosta with blue star creeper draws attention to the striking blue hosta foliage. Edge' are variegated they complement each other. The wonderfully fragrant winter daphne (Daphne odora ‘Aureomarginata’) has a more delicate but equally beautiful variegation. 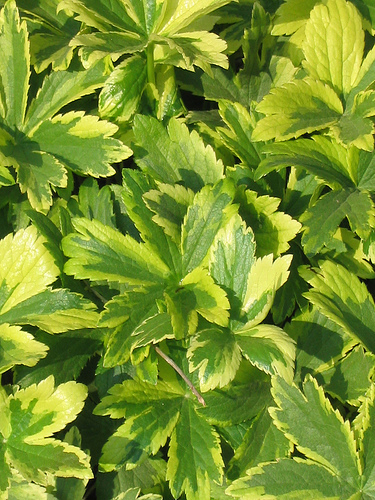 Its tapering green leaves are edged in a delicate creamy-yellow. The perennial toad lily ‘Gilt Edge’ (Tricyrtis formosa) has a similar pattern. Japanese forest grass (Hakonechloa macra ‘Aureola’) drapes like a waterfall of pale gold with its subtle green and yellow striped blades, looking beautiful cascading over boulders or placed at regular intervals along the front of a long border. I have noticed over the past few years that they seem to sprout all-green stems periodically which need to be removed promptly. This is called ‘reversion’ as the dominant gene tries to exert its superiority! When the veins of a leaf contrast with the background leaf color the overall effect is of a spidery web. 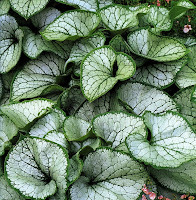 Siberian bugloss ‘Jack Frost’ (what a name…) (Brunnera macrophylla) is a fabulous shade loving perennial – one of the first to leaf out in spring and the last to fade in fall. The leaf is a striking silvery white, delicately etched with green veins. The blue forget-me-not like flowers add to the feminine picture but the compact mound of distinctive heart shaped foliage is reason enough to find space for this beauty. ﻿Mottled Italian Lords and Ladies (Arum italicum ‘Marmoratum’) is perhaps best known for its spikes of orange berries in summer yet the lush, arrow shaped leaves are patterned with dramatic creamy veins and look stunning from late summer through winter. Mayapple (Podophyllum sp) is a native of the Pacific Northwest but I was drawn to the variety ‘Kaleidoscope’ which gets its name from the fractured design of green, grey and burgundy spots. My daughter calls this the ‘toad plant’ as it reminds her of the skin of a warty old toad! Personally I think it is far too beautiful to be compared in such a way, but as I noted earlier the attractiveness of variegation is definitely in the eye of the beholder. 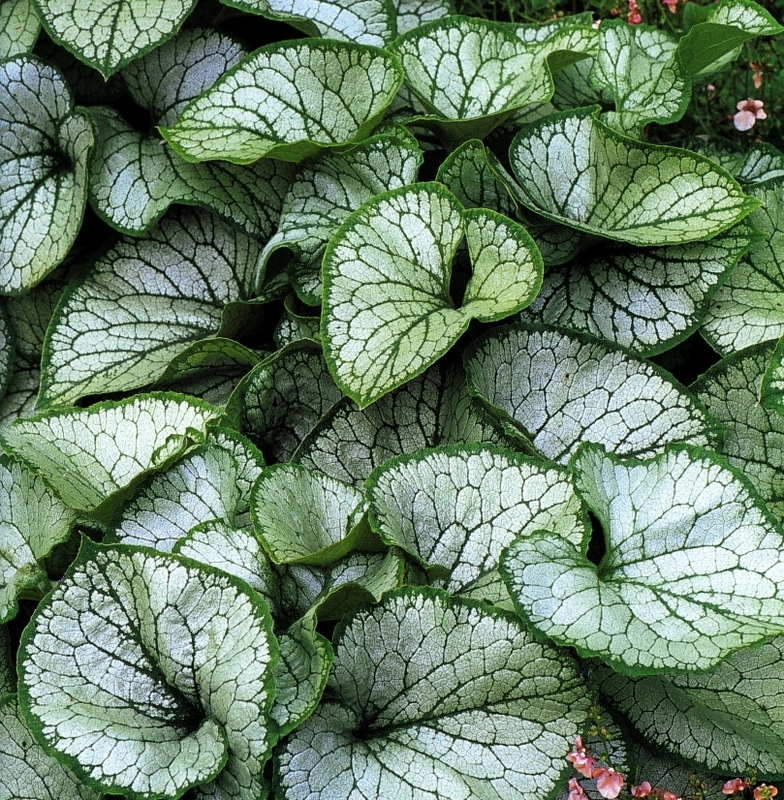 The common name for the spring flowering Pulmonaria is lungwort, reflecting both its likeness to the shape and spots of a diseased lung as well as its reputed medicinal properties in curing such ailments. I can’t speak as to the efficacy of such a remedy but I do like the spotted leaves of the many varieties available. ‘Roy Davidson’ is probably my favorite with its sprays of bluebell shaped flowers in shades of pink and blue. After they have finished blooming I cut the whole plant down to just an inch or so. The fresh leaves emerge nice and healthy, whereas not doing so seems to allow powdery mildew to take hold. One of my favorite multicolored shrubs is the leathery leaved leucothoe ‘Rainbow’ with wild splashes of red, green and yellow offering the opportunity for a variety of fun combinations in shady locations. 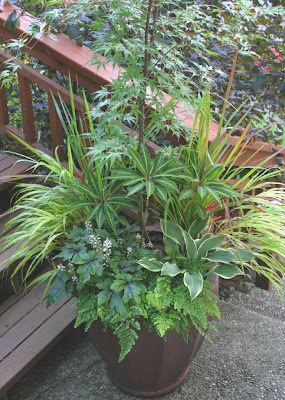 Red toned Heucheras, yellow grasses and bright green mosses make wonderful companions whether in a container or in the ground. The hardy impatiens (Impatiens omeiensis) may look delicate but it is surprisingly tough and steadily spreads to form stunning mounds of tiered starry foliage in yellow and green with a hint of burgundy. I have used this in a woodland inspired container design where it looked perfectly at home complementing a Japanese maple, hosta and grasses. 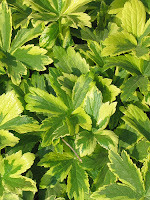 Consider where and when to use variegation. ﻿Bear in mind that how conspicuous a variegated leaf may appear and therefore where best to place it will depend upon several factors. A large, boldly variegated leaf may seem overpowering when seen close up yet from a distance it adds just enough interest to enliven a border. Conversely delicate variegation will be missed when viewed from afar or just appear as a muddy grey. Light plays a role in how variegation is seen; white shines in the shade but yellow variegation can often go more ‘green’ in such conditions. Aucuba is one of the few yellow variegated shrubs which does not lose its ‘oomph’ in this way. Finally the season itself may play a role in determining the intensity of the colors. 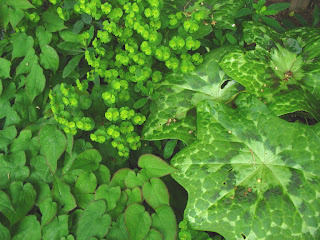 The yellow and green variegated wintercreeper (Euonymus fortunei ‘Emerald and Gold’) for example is brightest in winter when it takes on additional red tints while the perennial variegated masterwort ‘Sunningdale variegated’ (Astrantia major) shines in spring with broad gold margins to its green leaves but then softens to an overall subdued green for the remainder of the year. shows the best color in spring. ﻿Look at your garden and see where it might need a little lift. Here are just a few additional ideas. 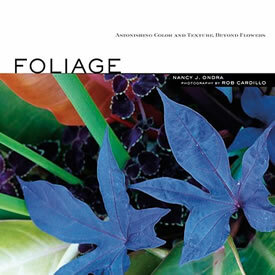 For further treasure hunting I love the book Foliage by Nancy Ondra which includes an excellent section on variegated and multicolored plants. Found your blog via LinkedIn Garden Writers. Well done - great information! Northwest Flower & Garden Show – it's here!